Carbon dioxide and water are the inorganic raw materials of photosynthesis. They arrive at a leaf's photosynthesizing cells by different routes: CO2 gas simply diffuses in via pores in the leaf stomata (1) and through the air spaces between the loosely packed cells of the leaf mesophyll (2); water is drawn up from the roots through a system of woody xylem vessels (3). The products of photosynthesis – simple water-soluble sugars – are loaded into phloem sieve tubes and distributed throughout the plant (4). Photosynthesis in a plant cell takes place within chloroplasts (B). Each chloroplast is bounded by a double membrane (1) that encloses a dense fluid known as the stroma (2). 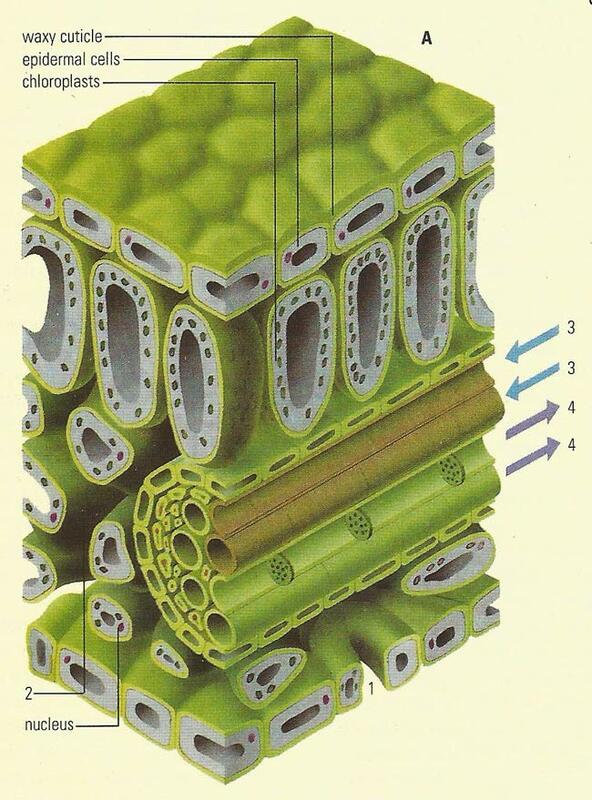 A third system of membranes within the chloroplast forms an interconnected set of flat, disk-like sacs called thylakoids (3), which are frequently stacked on top of one another to form structures called grana. The chloroplasts contain photosynthetic pigments, the most important of which is chlorophyll. This pigment absorbs light primarily in the blue, violet and red parts of the spectrum. Green light is not absorbed; it is because this light is reflected that leaves appear green. Photosynthesis involves a complex series of chemical reactions: for the sake of convenience, these are usually divided into the light dependent reactions, which occur on the thylakoid membrane, and light-independent reactions, which take place in the stroma. In the light-dependent reaction of photosynthesis (C), sunlight energy is trapped by chlorophyll and converted first into electrical, then into chemical energy, which is temporarily stored in the compounds ATP and NADPH. These compounds are later used as fuel to power the light-independent fixation of CO2 into sugars. All the chemical equipment needed or the light-dependent reaction is located on the thylakoid membrane. Light-trapping pigments, including chlorophyll, are grouped together on the outer wall of the thylakoid sac into units called photosystems (1). When light strikes a pigment molecule, one of its electrons becomes energized and is passed through the photosystem to an electron carrier in the membrane (2). Having lost an electron, the photosystem is left with a net positive charge: it is resupplied with electrons by splitting of water (H2O) (3), which also releases hydrogen ions (H+) into the thylakoid sac (4), and liberates gaseous oxygen (O2) (5). 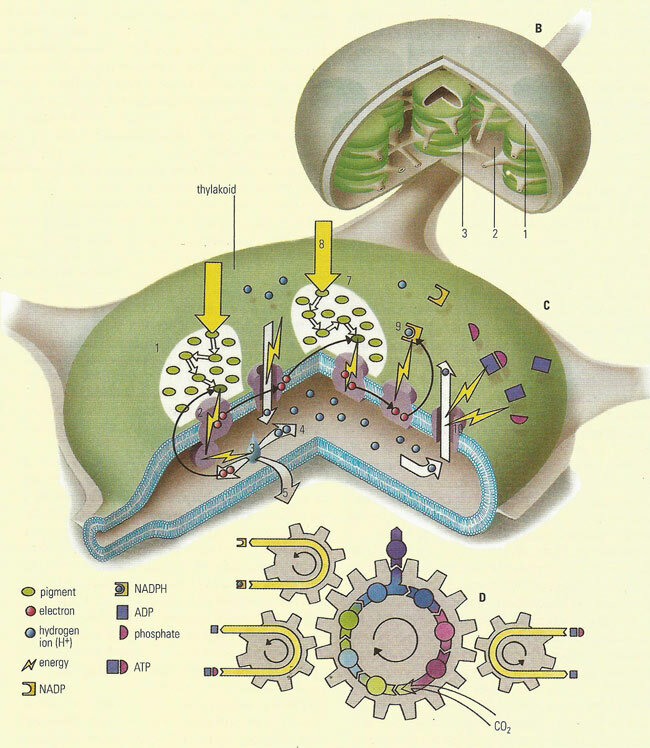 The energized electron is passed to another carrier in the thylakoid membrane: in this process, some of its energy is used to pump more H+ into the thylakoid sac (6). The electron passes through a second photosystem (7): this absorbs more light (8), boosting the electron's energy level. The reenergized electron is now passed through other electron carriers, giving up some of its energy on the way to fuel the formation of NADPH from NADP and hydrogen ions (9). The result is that the H+ concentration within the thylakoid sac rises to over 1,000 times that in the stroma, generating a chemical pressure. H+ can only "leak" back into the stroma through special membrane-spanning turbines – ATP synthetase enzymes (10). As H+ ions pass through these they drive the synthesis of ATP from ADP and phosphate as in cell mitochondria. The energy-rich compounds ATP and NADPH are then used to power the formation of sugar in the light-independent reactions in the stroma (D). CO2 is bound to a series of intermediate compounds, using energy along the way, before finally being released as a sugar (1). Although in detail photosynthesis is a complex sequence of reactions, there are two main stages, both of which, in the case of plants and algae, take place in the cell organelles known as chloroplasts. In the light reaction, also called photolysis or the photochemical stage, chlorophyll (the key chemical in the whole process) is activated by absorbing a photon of light, initiating a sequence of reactions in which the energy-rich compounds ATP (adenosine triphosphate) and TPNH (the reduced form of triphosphopyridine nucleotide – TPN) are made, water being decomposed to give free oxygen for the process. In the second stage, the dark reaction, also called the Calvin cycle or the thermochemical stage, the ATP and TPNH provide the energy for the assimilation of carbon dioxide gas, yielding a variety of sugars from which other sugars and carbohydrates, including starch can be built up. Virtually all life on Earth depends on the Sun's energy. This energy is first stored in the form of simple sugars, and every year more than 150,000 million tons of sugars are produced by photosynthesis. In green plants and algae, photosynthesis takes place in the chloroplasts – miniature solar converters inside the plant's cells. Chloroplasts contain the green pigment chlorophyll, which absorbs light. The energy of light is transferred to the chlorophyll molecule which then passes it on through a complicated chain of reactions and biochemical processes that finally result in the formation of simple, organic compounds. At the same time, water is split into its component atoms, producing oxygen gas: oxygen is thus a by-product of photosynthesis. Sugars are used by the plant as fuel for respiration, which generates chemical energy in mitochondria to power biochemical reactions essential for survival and growth. Respiration also produces carbon dioxide (CO2) as a waste product, which can then be used again for photosynthesis. The products of photosynthesis also represent the starting point for the formation of other simple organic molecules. These can be combined into larger molecules such as proteins, nucleic acids, polysaccharides, and lipids, from which all living material is made. Plants generally store food in the form of sucrose, a compound of the sugars glucose and fructose, together with starch. Photosynthetic pigments are a plant's pigments responsible for the capture of light during the light reactions of photosynthesis. The three main types of photosynthetic pigments are the chlorophylls, the carotenoids, and the phycobilins. Since each pigment reacts with only a narrow range of the spectrum, there is usually a need to produce several kinds of pigments, each of a different color, to capture more of the Sun's energy.